Valley Dental Group Welcomes New Patients! Click the image above to download your $50 gift card. 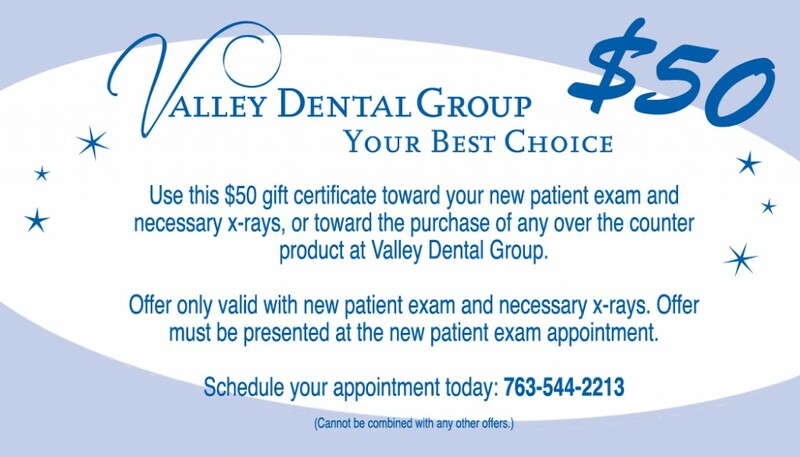 We are excited you have chosen Valley Dental Group for your dental health care! We look forward to meeting you and getting your smile healthy! First, you’ll want to transfer your dental records and x-rays to us. For patient privacy reasons, we are not able to transfer records for you; only you can officially transfer your medical records. Please use this Release of Dental Records Form. Once completed, please send it to your previous clinic and theyll transfer your records to us. Now, just call our office at 763-544-2213, or use the on-line scheduling link above to schedule with the dentist of your choice, on a day that works best for you.